Last night, Bigg Boss wrapped the nominations task for the contestants and tonight the housemates will gear up for their next luxury budget task, which will also determine the next contenders for captaincy. After Tuesday night's episode, Hina Khan, Benafshah and Sapna Chowdhary emerged as nominated contestants and tonight everyone will participate in the new luxury budget task. 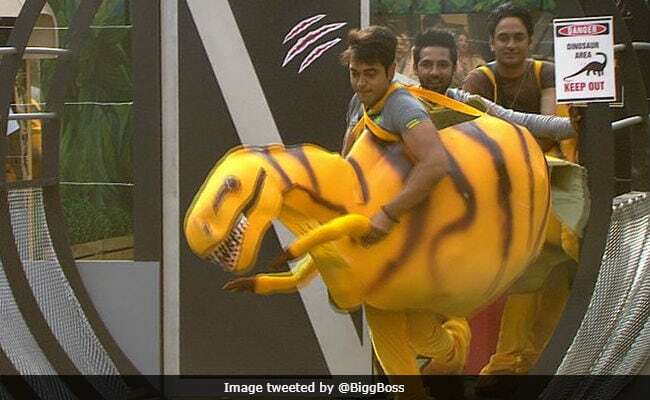 Vikas Gupta, Luv Tyagi and Puneesh Sharma will play three dinosaurs while the rest of the contestants will become the workers of the dino-theme park. As part of the task, the three dinosaurs will destroy pictures of the contestants placed in the activity area thereby crushing that contestant's chance to become the next captain. The three dinosaurs will be asked to work as per their own accord and not discuss the candidate they would want to eliminate but of course, Vikas, Puneesh and Luv will break the rule. Vikas will reveal to the others that Luv and Puneesh asked him to kick out Sapna's picture, which will infuriate her and she will destroy her own picture, thereby breaking Bigg Boss' rules. Hina (who broke Bigg Boss' rule last night and paid the price for it) and Hiten will school Sapna for jeopardizing the luxury budget. In another segment of the show, Arshi Khan and Shilpa Shinde will discuss Hina Khan's growing arrogance and the way in which demeans Shilpa. Shilpa will break down and reveal what happened between her and Hina, which broke her.